It’s always special to receive a homemade note, especially on Valentine’s Day. 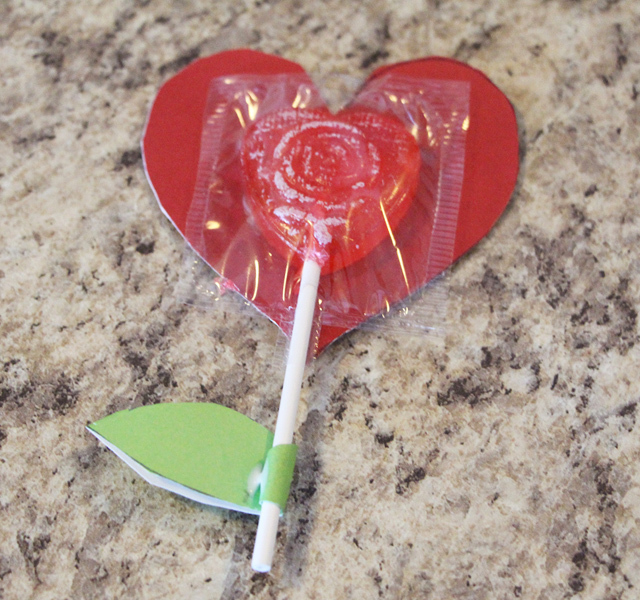 Here’s a sweet and easy craft to make Valentines everyone will love. 1. Cut out heart shapes, about 2-3 inches in size. You can grab a template online, or even print a heart shape directly on to the paper. You can also use the classic trick of folding the paper in half and cutting half of the heart shape out. 2. Cut out the leaves. You will need two to three green leaves per Valentine. Take the time to print out a leaf shape or use a pencil to trace the shape. 3. Grap a lollipop and put a small square of double-sided tape on one side. Place the lollipop in the centre of the heart so that the stick points down to the point of the heart. 4. Take a paper leaf and add a tiny drop of glue to one end. Carefully wrap the end once around the lollipop stick, and add glue if necessary to secure the leaf. 5. Repeat the same process with one or two more leaves on the stick. Have fun arranging the leaves on the stem to look more natural. 6. Allow the glue to dry for a couple hours and once dry, you can scrawl a note on the back of the heart! This quick and easy craft is great if your child needs to make a large number of Valentines for their class. It’s also a quick craft if you’re looking to leave your partner a sweet love note or reminder!